The Reserves Experience is back on the road this autumn. Having already visited Newcastle, it is moving on to London at the Westminster Conference Centre, 1 Victoria Street, London SW1H 0ET on Wednesday 2 November. The event is sure to inspire, enlighten and surprise you. At least that’s what those who’ve been to previous Reserves Experience events have told us! So, whatever you do in the Civil Service - whether you’re a director, a line manager, an HR specialist or if you just want to find out a little more about joining the Reserves - you’ll certainly find something to intrigue and engage you at the London Reserves Experience. It’ll only take a couple of hours of your time. Get a taste of life as a Reservist, the sorts of challenges they’re likely to confront and the experiences they gain. Did you know that there are literally hundreds of different and exciting opportunities to choose from in the Royal Navy, Army and RAF Reserves? There’s so much more to being a Reservist than combat roles. Reserve service gives you the chance to develop a whole range of different, valuable and transferable skills, such as leadership, communication, teamwork, decision-making, working under pressure and delivering at pace. You’ll be amazed at just how relevant the training, skills and experience you gain in the Reserves are to your Civil Service role and the extent to which they can be put to good use back in the day job. You’ll hear first-hand about who they are, what they do and how they successfully balance the Reserves with a job in the Civil Service. Every government department recognises the commitment made to Reserve service by giving its Reservist employees 15 days' special paid leave every year for training. The Reserves Experience is designed to be immersive and highly interactive. For example, as well as trying out some of the kit, you’ll even get the chance to carry out a simple group task to bring out your leadership and teamwork skills. Last, but by no means least, have some fun with your colleagues! So, if we’ve piqued your interest, why not register now to attend the London Reserves Experience on Wednesday 2 November. I guess this must be aimed at younger people. But what opportunities are available to older staff (i.e. 62 year old ex Troop Commander in the Royal Artillery)? Is there a Reserves Experience planned for 2017? It’s fantastic to read that the day was a success. 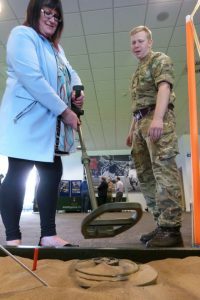 RAF Leeming held a Civil Service Challenge day earlier this year also to allow the CS’s to experience and learn of the roles available within the reserves. Would it be possible to hold an event in the midlands? Thanks for your interest in the London Reserves Experience. We haven’t yet finalised our plans for 2017 but we’ll keep you posted on future activities via Civil Service News.